6 x 2 x 37.5 g packs Chicken Entrée (two servings per pack). 6 x 2 x 37.5g packs Beef Entrée (two servings per pack). 6 x 2 x 37.5 g packs Salmon Entrée (two servings per pack). 6 x 2 x 37.5g packs Whitefish & Tuna Entrée (two servings per pack). Total of 48 servings. 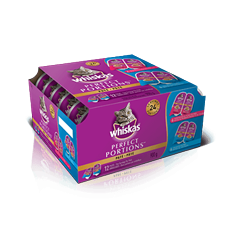 WHISKAS ® PERFECT PORTIONS™ 24 Variety Pack is rated 4.5 out of 5 by 66. Rated 4 out of 5 by GINNERGON_350256793 from We have two indoor cats and a pregnant stray cat that has started to show up at our door lately. My cats normally only get dry cat food so enjoyed the moist food very much..so much I got meowed at whenever I went to the cupboard where I kept the whiskas perfect portion pate. The outdoor stray was very thin and her fur didn't look too great when she started showing up since feeding her a full container each day with some dry as well she is filling in nicely and her fur is now shiny and fuller. I'm sure the whiskas is helping to feed those kittens she is busy growing. I will actually be going to buy more as I only have 2 containers left. Now if I could only get enough coupons to feed all the strays!! Rated 5 out of 5 by Wienner61 from Great product We have six cats and they are very fussy on what they eat. I have tried several dry and wet foods that they would not eat,but when I tried them on the Whiskas dry Brand and they loved it. I feed them a balance of wet and dry food so I tried them on Perfect Portions and they love it. I find this product just great from the handy portions and the variety of flavours available. With six cats I spend a lot on cat food in a month and find Whiskas products a great buy for my money. I would definitely recommend this product to anyone. Rated 5 out of 5 by PENNYMON_350259814 from My little Tina LOVES Whiskas. In our home we call it Gravy All you do is ask her Do you want gravies? and zoom she will run as fast as those little paws will carry her. LOL I personally think it smells great and I like that it comes in containers that are PERRRFECT for Tina. Her favorite is that salmon. But she will not complain about the beef, chicken or whitefish either. We will continue to purchase Whiskas and spread the word about it. Tiny say Thank you! She is one happy cat. Rated 5 out of 5 by KJ143 from Cat loves it I bought this 24 pack from Walmart and my cat loves the individual portions so much he licks the bowl clean. I like that there is no leftovers to clean up after and it avoids free feeding. I would like if they didn't use so much meat-by-products or mystery meat in the product however. Hopefully Whiskas will do like all the major pet food producers are doing these days and turning to real meat and fish only with supplemental grains and/or vegetables and less preservatives and such. Rated 5 out of 5 by CAROLYNRON_350329795 from My cat gobbles this up every time I feed him! I like that there is a variety of flavours so he never gets bored. I also love the packaging because I can choose whether or not to give different portion sizes without a smelly can in my fridge! The food easily falls out of the container and saves time from having to scoop from a can. I'll definitely continue to feed him this brand! I was fortunate enough to try it for free! Thanks SampleSource! Rated 5 out of 5 by TIFFANYLQC_350250337 from Let's face it. Cat food is gross. And with Perfect Portions there is no fuss and no muss with feeding your feline fur baby. The portions are amazing and simple and the flavors are going over well in my household. Since I have two cats the portions are going fast so I know the cats are loving it. They have not shown any sign of discomfort or pain or digestive issues since switching. We are officially new customers. Rated 5 out of 5 by SARAH_MNB_350405461 from I used the coupon to purchase the variety pack of 24 cans. I kept 12 of the cans for myself and donated 12 cans to my local SPCA. They were so appreciative of the gift. My cats love the Whiskas soft food variety packs and I knew the shelter kitties would too. The single serve packs are super convenient and practically mess-free! Thank you, samplesource for allowing me to try the product and help my community! WHISKAS® PERFECT PORTIONS™ Paté Chicken Entrée: CHICKEN, CHICKEN BROTH, CHICKEN LIVER, POULTRY BY-PRODUCTS, MEAT BY-PRODUCTS, GUAR GUM, VITAMINS AND MINERALS, COLOUR, SODIUM TRIPOLYPHOSPHATE, FISH OIL (PRESERVED WITH MIXED TOCOPHEROLS), dl-METHIONINE, SALT, TAURINE. 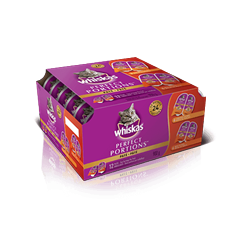 WHISKAS® PERFECT PORTIONS™ Beef Entrée: CHICKEN BROTH, BEEF, CHICKEN, CHICKEN LIVER, POULTRY BY-PRODUCTS, MEAT BY-PRODUCTS, VITAMINS AND MINERALS, GUAR GUM, COLOUR, SODIUM TRIPOLYPHOSPHATE, FISH OIL (PRESERVED WITH MIXED TOCOPHEROLS), dl-METHIONINE, SALT, TAURINE. 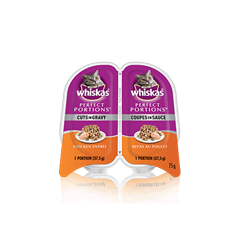 WHISKAS® PERFECT PORTIONS™ Paté Salmon Entrée: CHICKEN BROTH, SALMON, CHICKEN, CHICKEN LIVER, POULTRY BY-PRODUCTS, MEAT BY-PRODUCTS, GUAR GUM, VITAMINS AND MINERALS, COLOUR, SODIUM TRIPOLYPHOSPHATE, FISH OIL (PRESERVED WITH MIXED TOCOPHEROLS), dl-METHIONINE, SALT, TAURINE. WHISKAS® PERFECT PORTIONS™ Paté Whitefish & Tuna Entrée: CHICKEN BROTH, WHITEFISH, CHICKEN, TUNA, CHICKEN LIVER, POULTRY BY-PRODUCTS, MEAT BY-PRODUCTS, COLOUR, VITAMINS AND MINERALS, GUAR GUM, SODIUM TRIPOLYPHOSPHATE, FISH OIL (PRESERVED WITH MIXED TOCOPHEROLS), dl-METHIONINE, SALT, TAURINE. 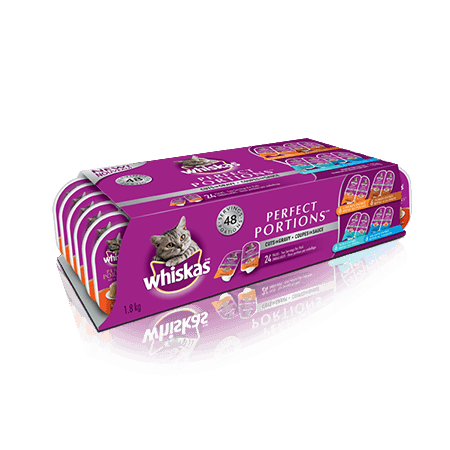 WHISKAS® PERFECT PORTIONS™ 24 Variety Pack is formulated to meet the nutritional levels established by the AAFCO Cat Food Nutrient Profiles for all life stages.